I've been eating a good deal less meat and embracing more of a plant-based diet in recent months. I've not necessarily went all-out vegetarian, but I don't eat much meat on a regular basis. So, I've begun to get more and more creative with swapping in veggies, grains or the like for meat in my favorite dishes lately. (I've recently fallen in love with lentils in place of ground beef in Sloppy Joe Sandwiches, for example.) 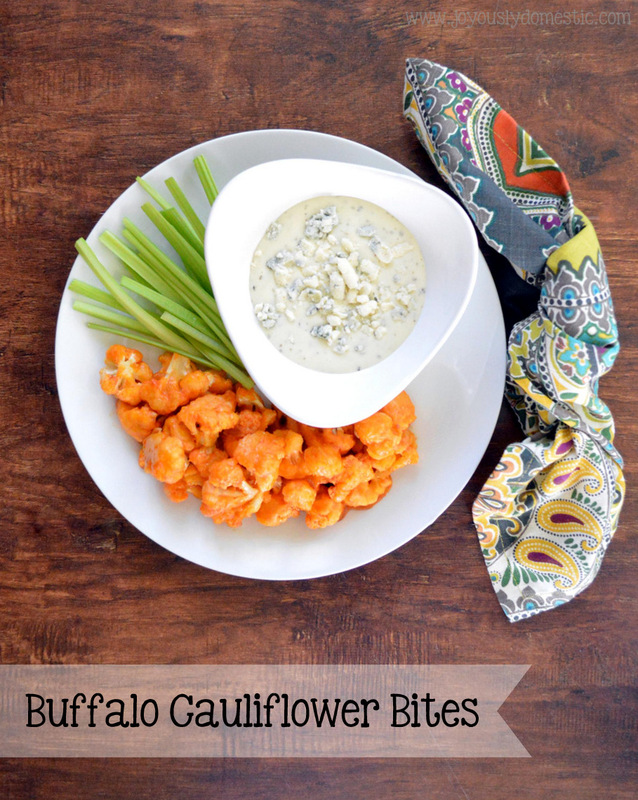 Since I adore the flavors of Buffalo chicken, I thought I'd take a run at modifying the standard utilizing a little creativity involving cauliflower. The verdict: I'm like, totally addicted. I could not shovel these little cauliflower bites into my mouth fast enough while I was testing this recipe. I, honestly, did not feel as if I were missing out on anything. In fact, I pretty much prefer this recipe now over using chicken. The buttery, perfectly-spicy wing sauce is right there in the forefront of each bite followed by the cool relief of creamy blue cheese dressing. And, of course these have to be served with crisp, refreshing celery sticks ... following suit in honor of the original. I will say that because these bites are baked and not fried, don't expect as crisp of an outer texture on the cauliflower pieces as you're probably used to with Buffalo wings. (I'm sure these could be deep-fried once battered if you're so inclined.) And, although it does take ten minutes or so to dip each little floret into the batter individually before baking, this recipe is a very simple one and comes together quite easily. Preheat oven to 425 degrees. Cover a large sheet tray with foil and spray thoroughly with non-stick spray. Set aside. Prep cauliflower by washing it and breaking half of the head into bite-size pieces. Set aside. In a medium mixing bowl, combine together flour, cornstarch, water and garlic powder. Dip each floret into the batter, shake off excess and lay onto sheet pan. Do not allow pieces to touch. Thoroughly spray each floret with additional non-stick spray. Place pan into preheated oven. Bake for 15 - 17 minutes. If necessary (pieces get too dark, etc. ), florets can be flipped during baking. Meanwhile, combine melted butter and hot sauce in a medium bowl. Set aside. Remove pan from oven once florets start to crisp and become slightly brown. Gently toss florets with sauce/butter mixture (or sauce can be brushed onto florets to thoroughly coat). Return florets to oven - evenly spread back out across pan - and bake for 5 - 7 additional minutes. Remove. Serve immediately with dressing and celery sticks. Served there with a honey mustard dipping sauce. Absolutely delicious. Awesome. Glad that you enjoyed the recipe! They are perfect for game day! Sounds great! I love roasted cauliflower and spicy. I’m def. going to try this recipe! Hope you enjoy the recipe, William!